The TV Box. A hot new trend of jailbreaking a Firestick with Kodi free streaming has taken the internet by storm. Is it illegal to jailbreak a Firestick and convert it to a Kodi TV Box to watch paid TV for free though? This is a tricky question with multiple answers. So before you go buying a Firestick on Craigslist with promises of free TV from Kodi, be sure to read this article carefully. Because the truth is, you need a VPN, no matter what. And it does not get better than this monthly price for “free TV“. Is a hacked Firestick Legal With Kodi? The big question, is it legal to hack your Firestick? Technically, yes it is legal. You can do whatever you want with it as it is your property. You will not be breaking any laws in America by doing so. I can not speak for other countries as laws may differ. Check with your local law making government. Is Kodi legal in the USA? Yes, of course it is. You can get it on any app store such as Google Play. It is a legal, legit streaming media player. There is no wrong in downloading this app to your Amazon Firestick. This means you can legally buy a Firestick with Kodi streaming and not be in any trouble. Which is why you see so many people selling them online. It may be too advanced and technicle for most to actually install Kodi on their home Firestick so they buy them already jailbroken. Are you following? There is nothing illegal about the action of jailbreaking, unlocking or buying a Firestick with Kodi on it. Watching TV For Free With Kodi – Legal or Not? However, Kodi or other such hacked Firestick devices may open up a plethora of free streaming content which may otherwise cost money or have a subscription fee such as Netflix or Hulu. This is where you start to break the law. You are not allowed to violate copyrighted material or receive paid services for free. Do you follow? That is stealing. If you are caught streaming or violating copyrighted material, your ISP may even suspend your service permanently and you won’t have any way to access the internet at all ever again. You may be sued, fined and more. Is it really worth it? 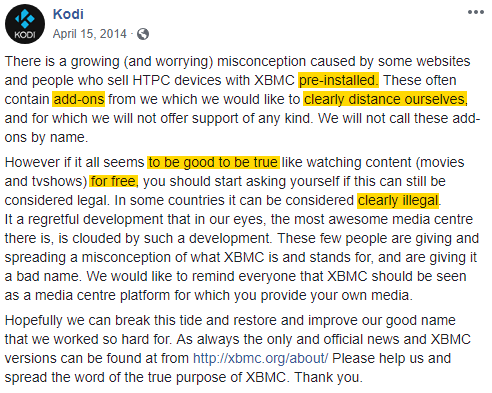 Kodi is not responsible for your use of third party add-ons and services to access illegal materials and they are very much against them. Here is a statement they made regarding piracy. But let’s face it, no one uses Kodi for anything other than streaming TV for free. That is where their user base comes from. Mainly jailbroken Fire Sticks bought on Craigslist and Facebook. They seem to be in denial. How Do I Legally Watch Free Streaming? This is why people who us services like Kodi on hacked Amazon Fire Sticks use services such as a cheap Kodi VPN to “hide their online activity”. It really is required to safely get “free streaming”. When you use a VPN(Virtual Private Network), you basically hide your online tracks from your ISP and the services you access. So while it is illegal to infringe on copyrighted material by using a hacked Firestick, with a VPN you may remain invisible. So that is the catch, “free TV” but with the cost of a monthly VPN subscription and knowing you are secretly breaking the law. Not by owning or cracking your Firestick, but by accessing paid material for free. The good news is, you won’t be caught with a VPN. You’re just a bad person. The benefits of a VPN do not stop at free Kodi TV. You can hide all of your internet tracks for every activity from your ISP and other prying eyes. This is becoming a standard among internet and computer savvy households. A VPN is now just part of using the internet. If you have privacy concerns, you need a VPN even if you do not plan on using a Kodi Firestick. In the future this will be a standard practice. VPN or not, we are not suggesting you access paid streaming content for free, but to use such free streaming TV services like Kodi third party add-ons you are forced to use a VPN to hide your internet tracks. Anyone that doe snot is foolish and will pay the price when it catches up with them down the line. And it will. The people selling you these devices online will not inform you of this cost or the legality of stealing tv shows because if they did you may not buy a hacked Firestick from them. But now you are informed and can make the choice on your own. Is it illegal to sell Firesticks with Kodi on it? Yes and no. If you are selling a jailbroken Firestick with the free media streaming app Kodi in its pure form, it is fine. Fully legal. However, if you are selling it with preloaded add-ons and advertising it as free TV and promoting piracy, you are breaking copyright laws and profiting from selling others paid services. You are not allowed to sell hacked services such as Netflix and Hulu. TV Box – Is Kodi Safe? Kodi is 100% legal on its own and a safe application. It does not contain any viruses or otherwise malicious code. The software is offered free on Google Play. But once again, it is not legal to use add-ons which provide pay services for free. You are not allowed to break copyright laws under any circumstances and if you plan to do so anyways, you must hide behind a VPN or pay the consequences.